September 15, 2017 November 22, 2017 - by [HayHayBeans] - 2 Comments. 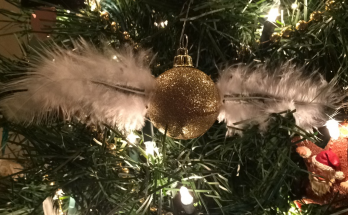 I’m so excited about Christmas that I’m starting early! My boyfriend and I decided we want to do a Michigan Wolverine themed Christmas since he is a huge Michigan fan. This has opened up a lot of ideas I want to do and I have to get started now to have them all done before Christmas time! 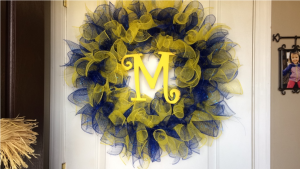 Anyways, I firstly wanted to make us a Michigan Christmas wreath! I saw a few tutorials on YouTube and tons of pictures on Pinterest that gave me many ideas on how to do this! I also wanted to create a step by step guide on how to create it in case other people want to learn how to do it as well. Below I have a list of all items needed, where I got them, and how much I spent on them. I always shop around and check each stores sales for the week before I purchase anything so I can make sure I get the best prices. I’m a broke college kid so I try to save as much money as possible! Haha. *These are the prices I paid using coupons or waiting for them to be on sale. Prices may differ depending on when you go. 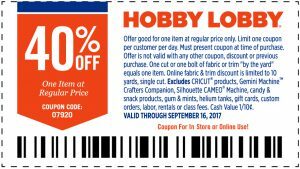 Make sure to always look online or check your email for great coupons like below! You can save so much money this way. 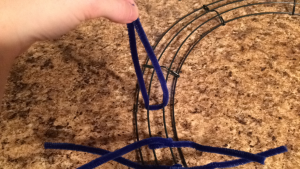 Start by putting your pipe cleaners on the 2 middle wires. 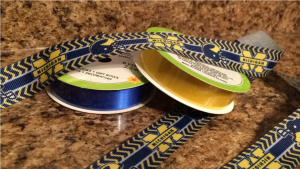 After you have it between the 2 middle wires, you will twist it around a couple of times until it is on there good. Keep adding pipe cleaners around until you have a good amount on. I know this seems like a lot for one section but I like the more full look. 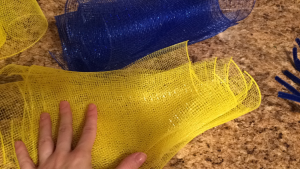 Start cutting your deco mesh! The great thing about this is you don’t have to make every piece the exact same size! I cut my pieces around 5 or 6 inches length that way they were still able to curl a bit. You can cut yours bigger if you’d like! Keep cutting until you have a pretty good pile of each color! 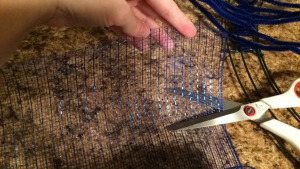 A great thing about deco mesh is it kinda already wants to curl a certain way. Roll it up the way its trying to curl and put three pieces together how I have pictured above. 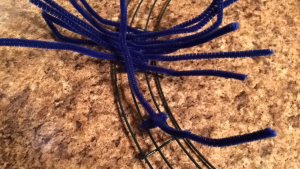 Push your other pipe cleaners out of the way and twist the one you are going to put the deco mesh on the other way. This way it is easier to lay it on and twist. Lay it on the pipe cleaner. 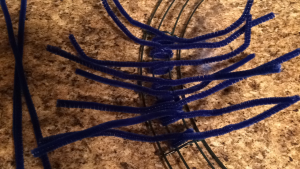 Twist the pipe cleaner around a few times until it feels secure. 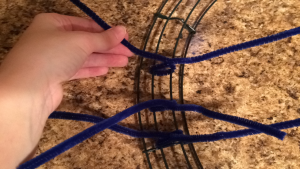 Push the two ends of the pipe cleaner to the other side of the wire wreath. 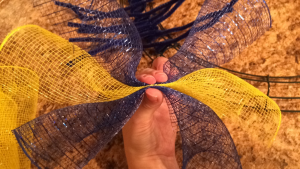 Flip the wire wreath over and twist the pipe cleaners just like you did the front. Make sure it is on there securely and feels snug. Keep adding until you get the wreath completely full! I ended up using 55 pipe cleaners total. 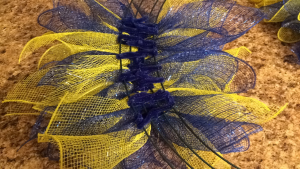 That was both the blue packets and 5 yellow pipe cleaners. 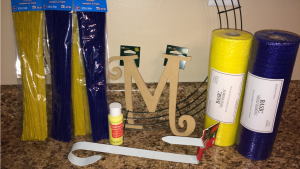 Grab a paint brush and start painting the “M” yellow! 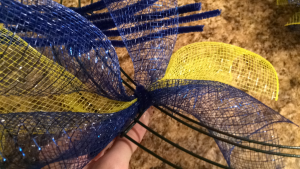 Let that dry and then you can hot glue that bad boy into the wreath! 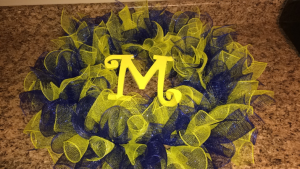 Lay the “M” down where you want and figure out what parts of it is touching the wreath/deco mesh. 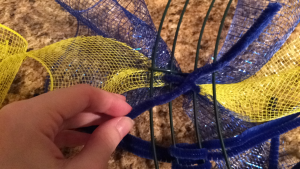 Warm up your hot glue gun and put glue in those areas. Then quickly lay it down on the wreath where you want. 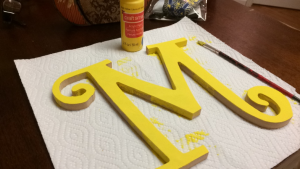 Lay something down onto the “M” to give it some pressure while it is drying. Once its dry it should look something like this! 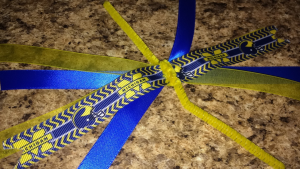 You could even leave it like this if you wanted or continue adding the ribbon and footballs like I did! 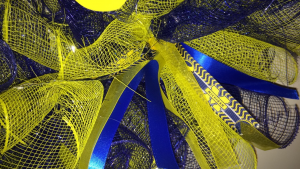 Twist the pipe cleaner around your ribbon and add it into your wreath just like you’ve been doing the deco mesh! 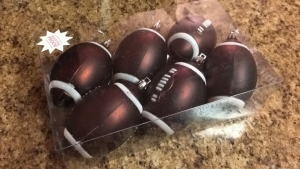 Do the same thing with the footballs. 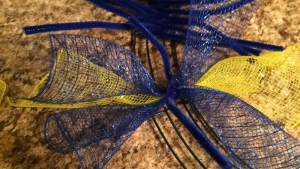 Put your pipe cleaner through the hole and twist it into the wreath. I just added mine into random spots! 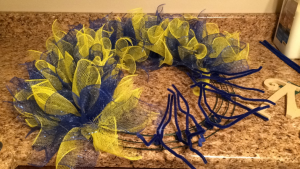 Put the door wreath hanger on a door in your house or the front door. 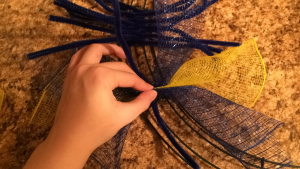 Then add a pipe cleaner to the top of your wreath in a loop so you can hang it from it! I hope you enjoyed this DIY and that it helps you on future wreaths if you decide to make some!! 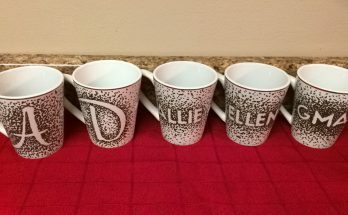 These are so fun to do and can be done really cheap! Your tutorial was simple and easy to understand I was just asked this prior weekend to make a football wreath When completed yours was gorgeous!!!!! Thank you!!! 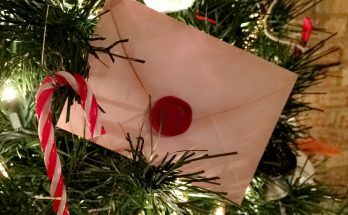 I really hope this helps out with yours! I already want to make another one but slightly smaller! 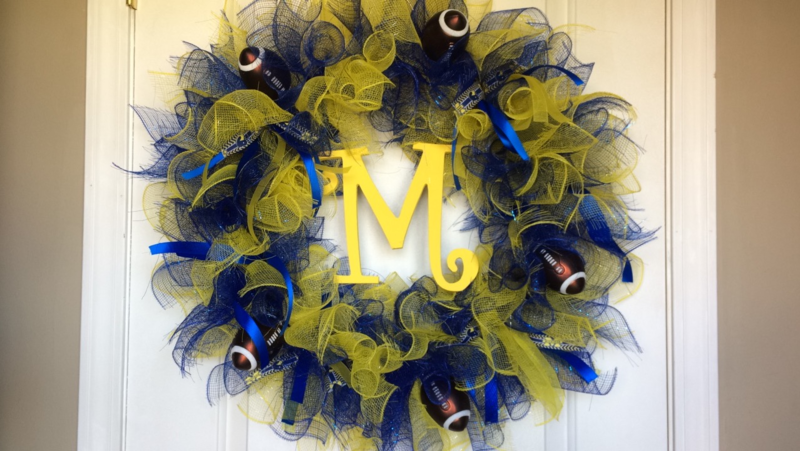 There’s so much you can do with these types of wreaths. I love it.